Online streaming services like Netflix, Hotstar, Amazon Prime Video etc are slowly taking over traditional TV viewing experience on DTH and Cable TV. This is the reason for the rise in smart TV sales. Though the price of smart TVs is lowering, it is still costly compared to regular LED TV. 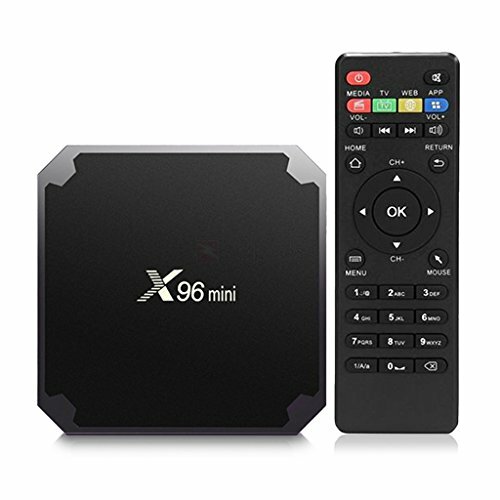 So if you are planning to buy a TV on a budget or already own an LED TV for online streaming services the best option is to get an Android TV box that can convert your regular TV to smart TV. In this post, we list out some of the best Android TV boxes available online in India. The price mentioned is at the time of writing. For many models, there is an option to pay in EMI as low as ₹150/month along with No Cost EMI option. HIGH-PERFORMANCE CONFIGURATION. Comes with Advanced Android 7.1 OS,powered by High-performance Amlogic Quad Core Cortex CPU,includes a Penta-Core Mail GPU that can reach speeds of up to 2.0GHz Ultra high frequency, more than four times performance improvements. LARGE STORAGE SPACE. 16GB ROM great large storage can allow you to more smoothly browse website, play games, run APPs, watch movie and give you more space to download more APPs, movie, music, game, etc for your entertainment and leisure. No need to worry about the memory space. PRE-INSTALLED PALYER. Advanced 17.3 Android KD Player is pre-installed,plenty of free applications are prepared.Fully loaded and unlimited films, music, videos, play TV and more are awaiting you. UHD 4K RESOLUTION. High preformace hardware video decode and output with 100Mbps cable network offer you high definition picture and fluently video playing. Say goodbye to the freezing and buffer. Appliactions- Online Browse all video websites,support Netflix,Hulu,Flixster, Youtube, etc. AppsApps download freely form android market,amazon app store etc. 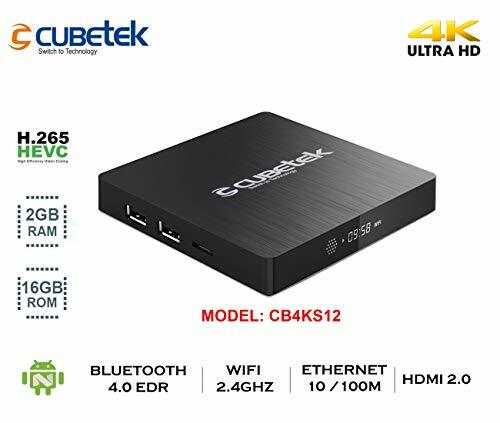 Cubetek CB4kTX2 powered by Rockchip RK3229 , CPU:ARMCortex-A7, Penta-core GPU processor, quad core processor, 2.0GHz Ultra high frequency and it can provide you with smooth experience to watch 4k Movies at highest resolution with no lags. CB4KTX2 Media Player with 2GB Ram, 16GB Rom is designed to connect to any tv, old new and comes with both AV & HDMI Cable and port with the device. Plays 4k Videos @60FPS for H.265V format at ease. Support external portable HDD upto 2TB. User Friendly Interface & Highly Portable device. Size of your palm. Allows Mirroring from phone from Airplay for Apple devices. Supports DLNA File Sharing. Bluetooth 4.0 for better connectivity. Voice Control that Does It All: Built-In Google Assistant and in Apps voice search. Search for photos, check the weather, set an alarm. Life should be simple. 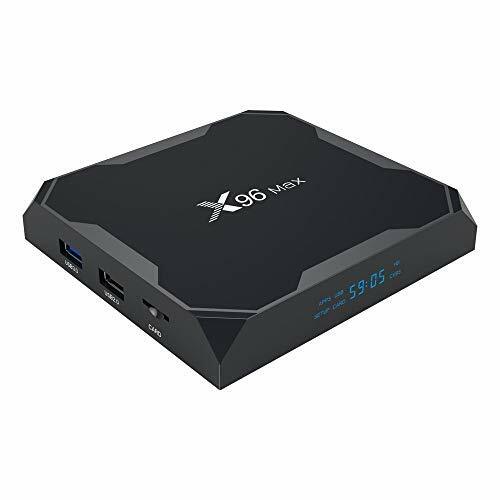 Runs on Android 8.1: X96 MAX is at the moment one of the first TV Boxes which runs on Android 8.1 an update to Oreo that showcases more ways to express yourself, along with a handful of other features and improvements to stability as well as performance. 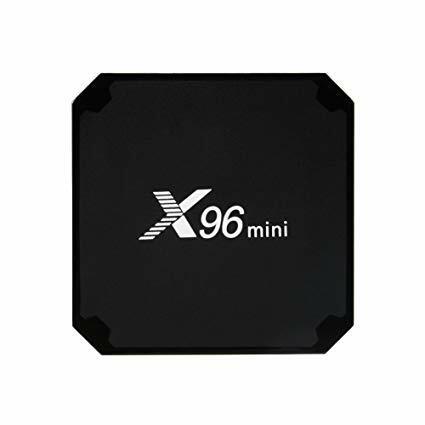 Amlogic S905X2: X96 MAX runs Android Oreo on Amlogic S905X2, an upgrade of its S905X2 predecessor with the same quad-core Cortex A53 cores paired with a ARM Dvalin MP2 GPU but adding VP9 hardware decoding, which is the absolute mainstream decoding formats around the global. DDR4 4GB RAM, eMMC 64GB: It boasts DDR4 4GB RAM, and eMMC 32GB, advantageous in performance, security and reliability, ascribing to the eMMC memory, ultimately delivering a richer end-user experience. 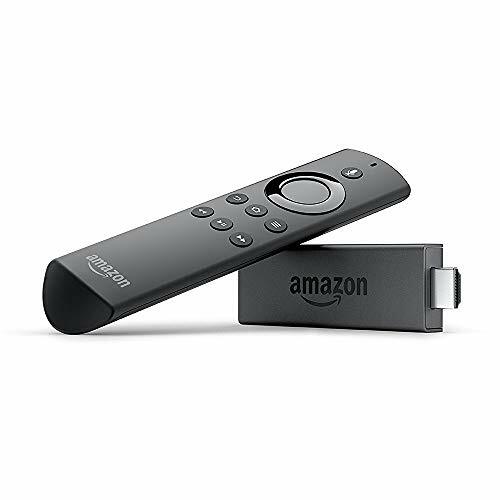 True 4K Media Player: While your average media box might only accept 1080P video playback, this gadget plays just about any 4K sources you could throw at it. Furthermore, it moves out into reality the fantasy of VP9 hardware decoding alongside the H.265. Like any Android-based media players, aside from the preinstalled s/w, it brings full access to Google Play Store apps like Netflix, Vudu, Skype, Picasa, Flicker, Youtube, Facebook etc.